Coles Catalogue Masterchef Recipes are alternative delicious meals which you can prefer for meals. Add color your your choice in this night. Try these recipes with the high quality products of Coles Catalogue. First two pages are exhibiting the new fresh meat, and the recipe of "roasted chicken with twice-baked potatoes". Check out details and learn how to prepare this meal using this latest Coles Catalogue. 4 days lef for these prices which you can see on the Coles Catalogue. 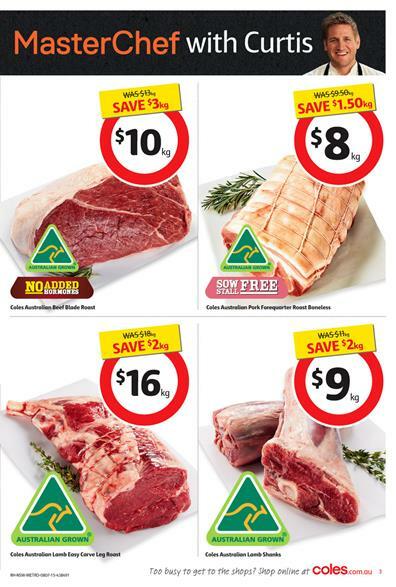 Australian fresh meat products selected from the top quality farms and they are all approved on pg 3. Seafood products including packaged ones are featured on pg 4. Brushed potatoes 1 kg is $1 on pg 5. Delicious bakery products like various breads including baguette, white batard, soft wraps tha everyone loves. See everyday prices for packaged bread products like Helga's, Wonder White etc on pg 7.
Colgate plax, whitening products, toothbrush and similar sort of more items on pg 22. The products which you can protect your skin from outside harm with and Olay cosmetics on pg 22-23. Special Whiskas cat food $1.80 pg 24. Pedigree dog food pg 25. Fairy Dishwashing liquid 870 mL everyday sale pg 26. 100% Aussie chicken whole chicken, $3.50 kg. See new meat products and recipe of "Roasted Chicken with twice-baked potatoes" pg; 2-4. Coles special price of potatoes. Brushed potatoes are only $1 on pg 5. Bakery products, packed bread variety and soft wraps pg, 6-7. Snacks, breakfast products, chocolate variety, Doritos, Schweppes on pg, 9 - 11. Packed food variety, canned products such as Nestle Milo, Sirena Tuna fish, Gold juice canola vegetable oil pg 13-15. Delicious winter warmer recipe of "Winter Greek chicken bake" on pg; 16. NEW prices for packed meals such as LeanCuisine steam or classic meals $5 on pg; 18. Similar to every week this is again a great range of products by Coles Catalogue online. Since a lot of products are available I will only share the summary of the whole list below but please go the preview page for all products. Colgate toothbrush and toothpaste, hair care products on pg; 22. Vitamin pills, tablets and more pg; 23. Special price of Whiskas cat food pg 24. Everyday price for some chemical cleaning supplies pg 25. To see latest prices of Coles please follow the reviews on the Coles Catalogue category. You can check out the details about the prices, read the reviews to reach a serious amount of savings. Meet the meat of Coles Catalogue on the pg; 2-3. You primary place to choose your favourite meat is Coles Catalogue online because of the most suitable price range and top quality meat products. Recipes change this place into source of happiness. Because they provide the quick, simple and budget saving technique for cooking meat. Learn how to cook perfect steak with Curtis ! In pg; 2 he tells you what to do step by step and he have the time for the cooking. Time chart shows you how much you need to cook your meat to be well done. If you like your steak rare or medium rare there should be a time for cooking as well. Please check out pg; 2 for the detailed information and recipe. Meatballs can be your solution as well. It is always quicker and simpler with meatballs or minced meat. Since it is rendered it is easy to fry. No place for hormons in Australian beef scotch fillet steak ! Visit pg; 3 for this product priced at $25 per kg. Masterchef Curtis Stone gives you the best recipe for the beef products. For more please go to Coles Catalogue. Coles Catalogue This Week 1 July 2015 07 July 2015 products and prices detailed in the preview of the products which you can see easily with using this post. Check out the details about these products in the latest catalogue. Coles offers half prices on the cover page for the products that are basically needed everyday. These are Lynx deo, Omo laundry powder, Dairy Milk delightful chocolate bar, Coke. See new prices on the first page. Coles Catalogue new meat prices for the top quality choices of beef, meatballs, lamb and similar sort of favorite meat products of Coles customers. Don't miss out these good prices. Everyday sale price of loaf cake, bread variety pg; 6&7. A new special by Coles: Daily Juice 2 L tea pg; 8&9. Deli and dairy products featuring a new price for Greek Yoghourt 1kg pg; 9. Coca Cola pack, Monster energy drink, chips and similar sort of snacks are available with current prices on pg; 10-11. Coles Simply Gluten free products of everyday sale pg; 12. Kellogg's cereals, some packed and canned food products, pg; 13. Coca Cola life, Masterfoods bbq sauce and more new products are available on pg; 14. Coles provides more than these and you can reach a significant amount of savings with the new Coles Catalogue online. On the main page find more of supermarket grocery catalogues. 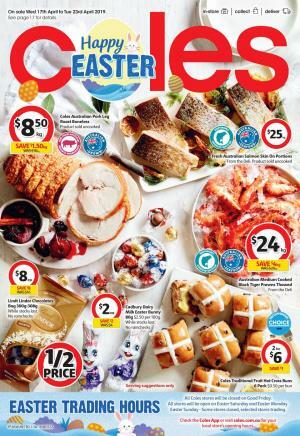 Again we got the chance to see new Coles Catalogue specials and recipes in between 17 Jun and 23 Jun 2015. Coles Catalogue Specials and Recipes 17 Jun 2015 products are generally the ones we used to see on these catalogues especially in 2015. They put a special attention on the new recipes again. Curtis Stone and more talented people write these recipes for the visitors of Coles Catalogue. Customers like these recipes upon the simplicity, taste and cost of them. Everyweek in May and Jun we had these to read. Very good choice of Coles Catalogue in these recipes are "Coq au Vin Blanc", "Lemon panna cotta", and ingredients for these recipes are available at Coles Catalogue. Coles Catalogue product categories are listed below. Please use the links of the products you want to view and click on the link to go to the page. Recipe of Coq Au Vin Blanc and chicken offers pg; 2-3. Australian lemons $0.80 ea (5 for $2) pg; 5. Coles bakery everyday sale pg; 6&7. Packed rounds, bread variety and cakes on pg; 8. Deli products such as sliced milano loin ham, salmon 4 pack pg; 9. Kraft cheese variety, Chobani yoghurt, juice pg; 11. Try new products of Coles. See pg; 12&13 for Chobani otas, Greek style yoghurt, Yoplait Bon Apetit yoghurt, Coca Cola Life and more on these pages.